So I signed up to the FT to read this one page and the interesting comments on it “Authors should back Amazon in the battle with Hachette”. 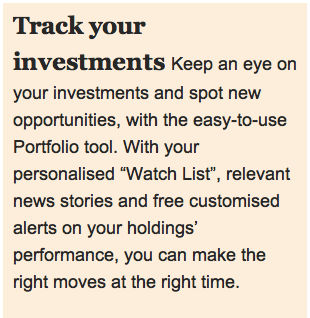 Which is fine, but now one day later the FT is offering me a free app tool so I can track my investments and “make the right moves at the right time”. How to explain to the FT I am actually quite worried about paying my phone bill, and have no investments to watch. That making the right moves at the right time probably means a very different thing to me than it does to them. Also, I am pretty sure I ticked their no thanks to all mailings boxes (yup, just confirmed that), so why just one day later are they inviting me to monitor investments that I do not own? Or, could this be intentional? After all, I did once borrow a story title from the FT, but never realised they’d noticed. If this is revenge with compound interest, I don’t mind so much (still think it’s a nice title, in fact).